Sky King is a Arabian gelding born in April of 2000. Which currently makes him 12. He’s a big, fat, grey, attitudinal but highly personable guy. 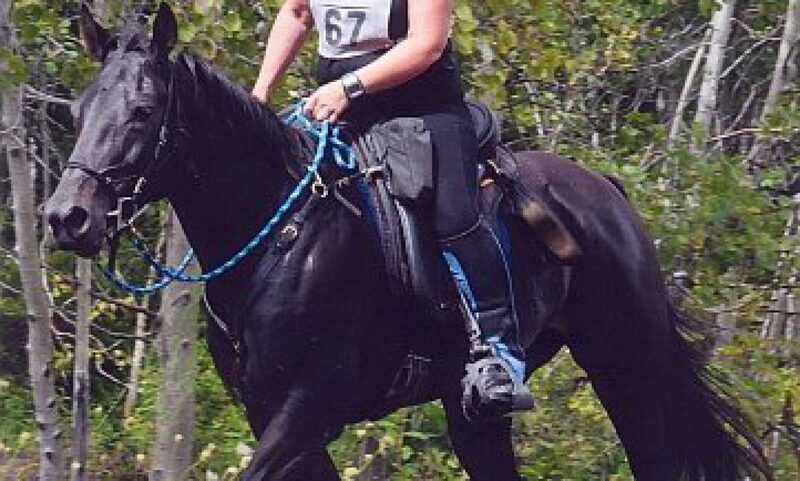 Despite being the world’s widest Arab (okay, slight exaggeration), he’s very athletic, and we finished our first fifty mile endurance ride in 2010. He’s done a few years of competitive trail and shorter distance rides (12 to 30 miles) as well. I bought him late in 2001, as a cute but very rude long yearling. I’ve had quite a few horses in my life, over about forty years. But he is a unique boy. Smart, loves humans, and interacts rather more intensely than most horses. He’s clicker trained, and would stand on his head happily if there was a treat involved. A couple of years ago he managed to make himself notorious by being stolen. A good friend, who is a news producer at a downtown Toronto television station, managed to put me in contact with all sorts of media types, who turned him into something of a national news story. About ten days after the coverage started, he turned up on a major road, flagging down traffic for himself (only King would jump out into a road and flag down a passer-by). The theory is that he was turned loose by whoever had him once he hit the national news stations. He came home with a nasty respiratory virus, and was not himself for a good six months. He recovered well from that, and did come back to compete a few times. But he’s been developing tumours all over his body in the last few years, and when he started developing some odd issues with soundness and muscle spasms, I had him looked at by a number of vets. No concrete diagnosis, but the consensus seems to be that he likely has a tumour interfering with something. Perhaps his spine. He’s happy and sound enough in the pasture. He doesn’t seem to have any pain. But he’s retired. Likely permanently. He’s such an entertaining guy though, that he still gives me great pleasure to have around, and I plan on just enjoying his company for the rest of his life. If such things interest you, he’s by Comar Ibn Azraff (a son of Azraff), out of a mare by Sky Knight (an Arab stallion imported from the Sky Stud in England). I think King’s size probably comes from Sky Knight who was a very large son of Indriss. Full bloodlines are here: Sky King pedigree. So basically he’s a mix of Polish and old English (mostly Crabbet) lines. Sounds an awful lot like my gelding (a standardbred). He’s a 10 year old who I met as an aggressive yearling. He is opinionated, way too crafty, but very friendly and people oriented. I’ve always loved Polish Arabs and look forward to learning more about your boy. Had a look at your blog (which I’ve linked to), and I see you ride endurance on your Standardbred. Very cool! He sounds like a real character. So pleased Sky King (great name) found his way home, even if he did have to hitch. I was doing some research on the Arabain horses that we bred including Trillium Hegira. I found that you did own a gelding Sky King, out of her. I ajlso read to my distress that he did go missing from his pasture. Did you ever get him back? I understand that he did very well in Competetive Trail Riding and was so proud to see that. Our stallion Sky Knight sired a mare called Nakina who was a National Champion in that particular discipline. We no longer have any horses but are always interested to hear any news of their offspring. Hi Elizabeth, I still have Sky King. He did get stolen a number of years ago, but I got him back after about 10 (very long!) days. I have a friend who is a news producer at a Toronto TV station who helped to get a great deal of media coverage of the story. And I’m quite sure that it was why he suddenly turned up on a busy road many miles from home.